I am normally a cheery guy, optimistic. One might even describe me as “chipper.” But not right now. I have been feeling resigned, almost numb, since Tuesday night. And it’s not even the fact that we’ve elected a crass boor as president. It’s not just the racism, and the misogyny, the hate. I mean, it IS all that. But it’s much worse than that. On election night in 1980 I was disappointed, but I told myself, “Maybe I’m wrong, maybe Reagan will be successful and things won’t be as bad as I thought.” But I was right, and they were. In 2000, I was angry, but I again said, “Maybe Bush isn’t as stupid as I think he is. Maybe what he’s been talking about will actually work and it’ll be all right.” But he was, it didn’t, and it wasn’t. But this is different. I can’t pretend that there’s a chance that things will work out. We’re about to see a rollback of the 20th century. Trump is going to undo everything Obama accomplished in the last eight years. He wants to smash Obama’s legacy. Affordable Care Act? Gone. Dodd-Frank consumer protection? You’re on your own when dealing with Wall Street. LGBT protection? Marriage equality? Woman’s right to choose? Forget it. Good luck. And you can expect a “religious freedom” law within the first month or so, which will allow discrimination. But while Trump sets his eye on the legacy of the nation’s black president, Paul Ryan and Mitch McConnell are going after the crippled one. FDR’s legacy, including Social Security, will be in the trash. Oh, sure. They’ll say they are saving Social Security. Don’t be fooled. What’s left will be a a shell. Also Medicare and Medicaid, which are more Lyndon Johnson’s legacy. They’ll replace it with block grants to states, so if you live in a progressive state you’re not necessarily screwed, although I wouldn’t count on it. But if you’re in Kansas, or Texas, or Alabama or here in Louisiana, you’re probably screwed. And a few other president’s will be knocked over as well. The rest of the Voting Rights Act. Roe v. Wade. Even some Republicans will be in the path of their bulldozer. The Clean Air Act and Clean Water Act from the Nixon years will be gone. Trump even mentioned getting rid of all those pesky food safety regulations. So there goes Teddy Roosevelt. I recommend everyone give a look at Upton Sinclair’s “The Jungle.” It’ll be instructive. And for those who say we should obstruct Trump the way the Republicans have obstructed Obama for eight years – they are forgetting the key difference. The Republicans have the votes. They did for the last eight years and they do now. Sure, Schumer might be able to stall a few things with some parliamentary tricks, deflect a few things, but he can’t stop them. We can protest. We can march, and flood them with emails and letters, we can object. Everything except actually stop them. For at least the next two years, and probably more like four at the least, they’ll get their way. They’ll roll back every bit of social progress accomplished in the last century. Welcome to 1899, folks. And the economy? Well, the only plan besides the wall that Trump every really enunciated was his massive tax cut, with the vast majority of that largesse going to the very rich and corporations. According to Trump, that will prime the economy and create huge amounts of investment in the private sector, creating jobs which will in turn generate such a booming economy that overall tax revenues will go up and save Social Security etc. etc. Two problems. First, when has that ever worked? Answer – never. In fact, the period of the greatest economic growth in our country’s history, the 1950s, was also the period with the highest tax rates. Because they knew they’d be taxed on their income, corporate owners tended to plow their earnings back into the company, increasing the value of their shares. Second, the recipients of the Trump tax breaks are the same people who already have most of the money, and they’re the ones who sent jobs overseas in the first place. So tell me how that’s gonna help. Are they suddenly going to experience a burst of America First pride and shift all their investments back? I could be wrong but it doesn’t seem likely. Oh, and even if they do, how long does that process take? They get the tax cuts next year, which won’t start showing up on their bottom line until the following year. Now they’ve got all this money and they’ll say, “Screw our overseas investments! Let’s expand or create production here! USA! USA! USA!” So they need to invest in new infrastructure, factories, production equipment. Figure that’s about another year before it starts having any effect. Meanwhile, the federal deficit is ballooning because of the cut in revenues, so their answer will be massive budget cuts. Oh yeah, and during the campaign Trump expressed willingness to increase the minimum wage (although I never got any sense of him being committed to it, it was just something he had to say) but the GOP House and Senate have been the roadblock to that. So, there’s that. And there’s a lot more likely, and I don’t see any way of stopping them until 2020. And even if we’re able to oust them in two or four years, they’ll leave behind a reactionary Supreme Court that will obstruct justice for the next couple of decades. So, good times! I don’t like feeling this way. I love my country and I see bad times ahead. Maybe a way to fight back will emerge. My optimism WILL return, I know that. But right now, all I can say is take care of yourself – because the government we’re about to get sure as hell won’t. Went to the polls Saturday and voted for Bernie Sanders in the Louisiana primary – and he lost 71 percent to 23. It’s part of a long, proud tradition. My primary support over the years has gone to George McGovern, Fred Harris (You’ve never heard of him, right? He’s still my all-time favorite candidate. ), Mo Udall, Jerry Brown, Gary Hart (pre-Monkey Business) and Howard Dean. On presidential elections I’m even – 5 wins, 5 losses – but in the primaries, man, I’m all over the map. Just not often in the winner’s circle. I need to get more organized. There’s all this stuff that I need to do, and in the morning I tend to pick whatever feels right, which means stuff that needs to get done isn’t. Look, I’m not James Patterson. I don’t have that kind of luxury. So for the rest of the month, I’m going to try holding my own feet to the fire. 8 a.m. to 11 I work on the WIP. Break for lunch, then spend two hours setting up the schedule for the late spring, summer. I have three big events, but I have to plan as many readings and appearances as I can around them. Have leads, now it’s time to start nailing them down. The sad truth is, even if you have an actual publisher, you still have to do most of the work of getting the word out about your book and making sales yourself. (Got some stories on that regard that perhaps I’ll share in a later post.) And when you’re self-publishing, that’s obviously doubly true. 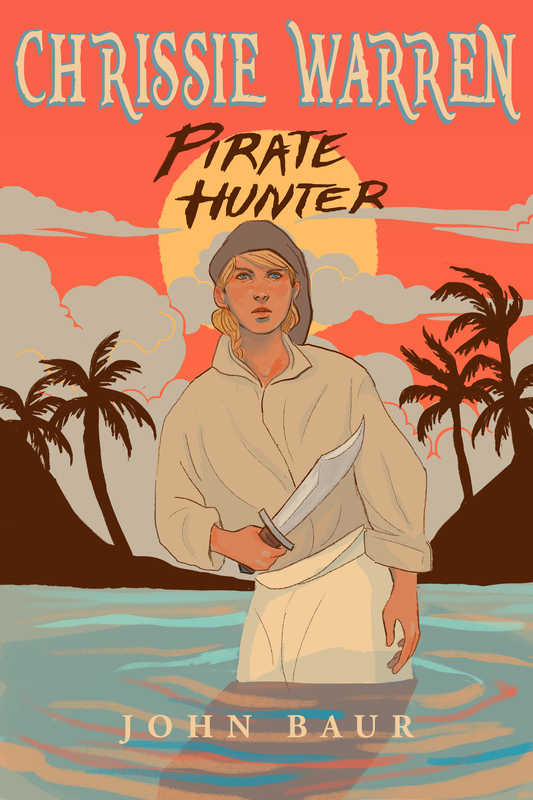 The launch of “Chrissie Warren: Pirate Hunter” went about as well as I could expect. Of course, not as well as I’d hoped. Who doesn’t hope for overnight success? And I’ve kind of taken the winter off from all of that. Time to dive in with both feet. There’s a lot of potential, but it’ll never be any more than that until I make it happen.